I am sure that all of you know I do not collect haute couture clothing. Well, actually, I do have three couture ensembles. One was a lucky and cheap flea market find, one was an eBay bargain, and the other was a splurge that I bought for myself to wear. But while I don’t seek out couture pieces to collect, I will on occasion, enjoy a good book on haute couture. 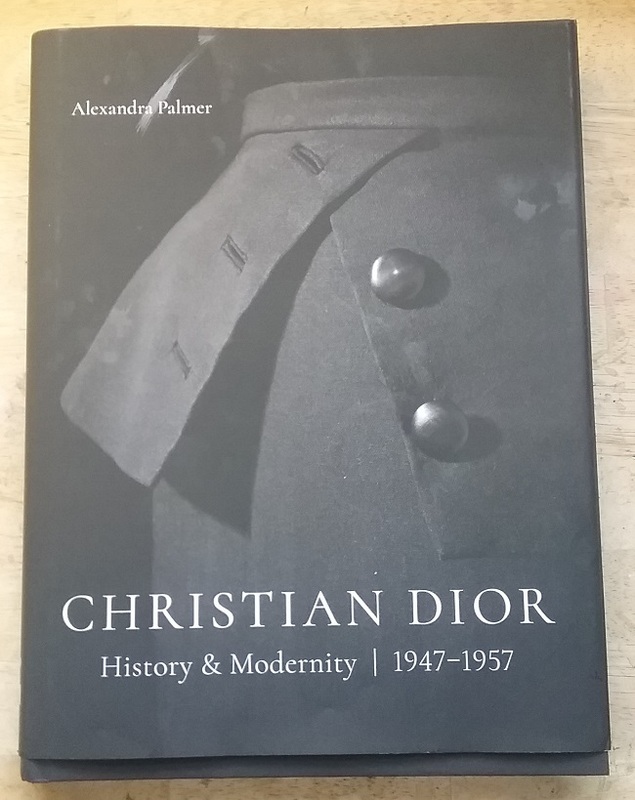 I bought Christian Dior: History & Modernity, 1947 – 1957 because a person whose opinion I respect recommended it on Instagram. And she was right. This is a great book. 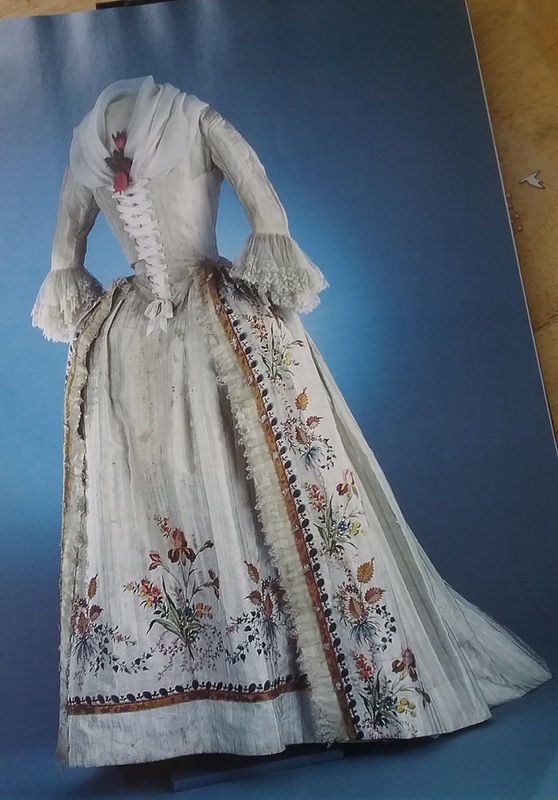 There was a time, not so long ago that books on historic fashion were all about the pretty pictures of beautiful clothes. And while I love looking at these books as much as anyone can, they always leave me wanting more. I want to know the historic context, the construction details, the fabrics used. In this new Dior book, that’s what Alexandra Palmer gives us. 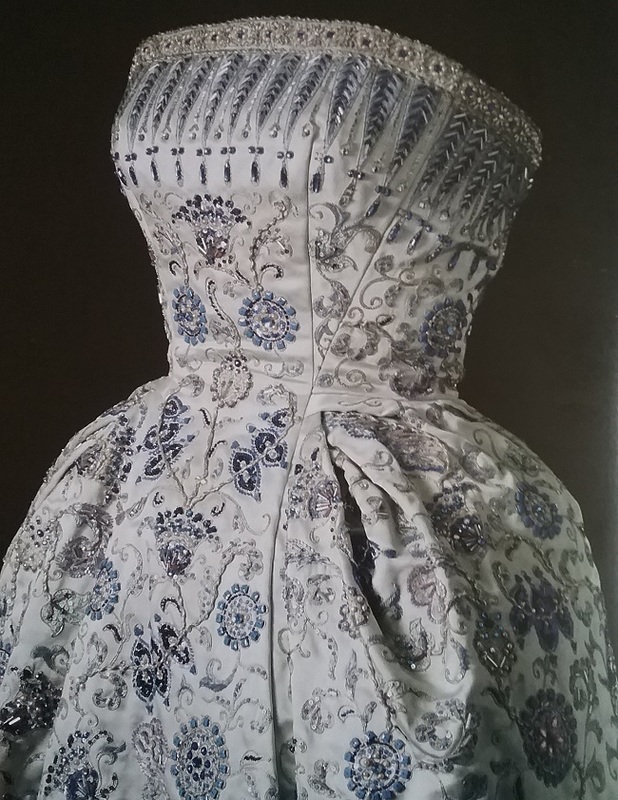 This is not so much a book about Dior as it is about the Dior garments in the collection of the Royal Ontario Museum. A year ago many of the dresses were on exhibition in the museum. I recently read a complaint of sorts that maybe the subject of Dior was being overexposed, with there being five major exhibitions within the past two years. All I can say is that if the exhibitions lead to the type of scholarship shown in this book, then overexposure is fine with me. The bulk of the book consists of garment “biographies” in which each dress is looked at in detail. 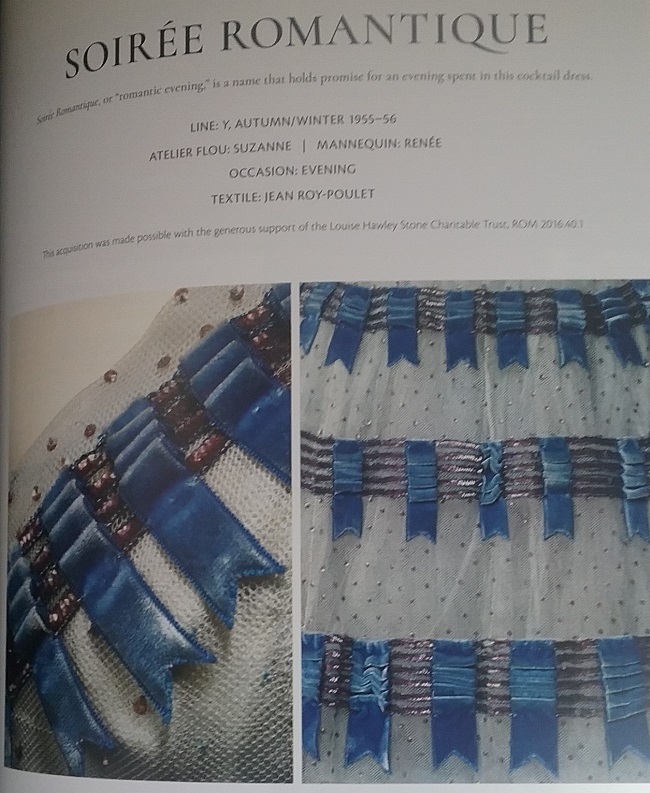 We are treated to the inner workings of construction, told who made the fabrics (and ribbons, as in the case of Soiree Romantique, above), shown the original press photo and any magazine features. To a person who loves the construction aspect of fashion, this is a real treat. There is so much information about each garment that I’ll be rereading each biography, taking my time to absorb the wealth of detail. We also get a really good look at how haute couture designers and workshops work with clients to individualize each design especially for the owner of the dress. 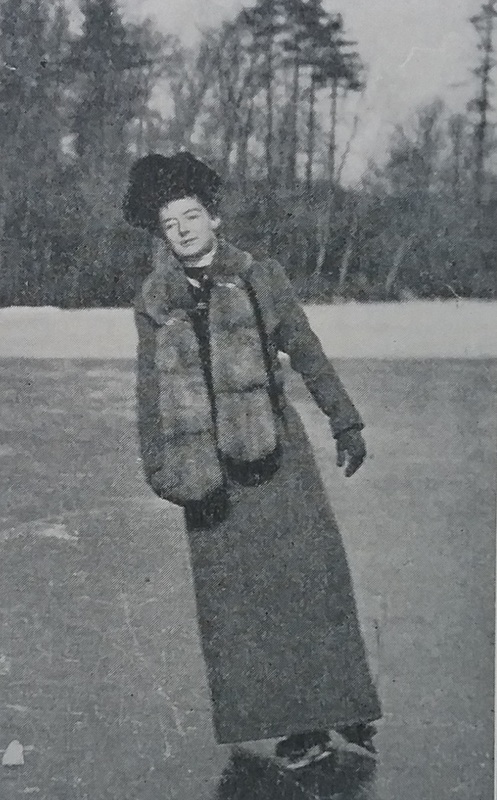 In many cases, there are vintage photographs of the original owner wearing her Dior. 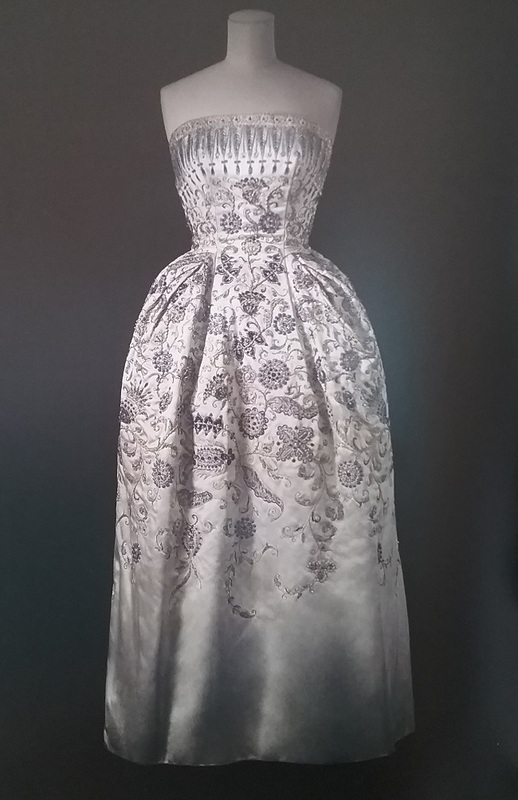 The gown above is Palmyre, and it was owned by Dorothy Boylen of Toronto. 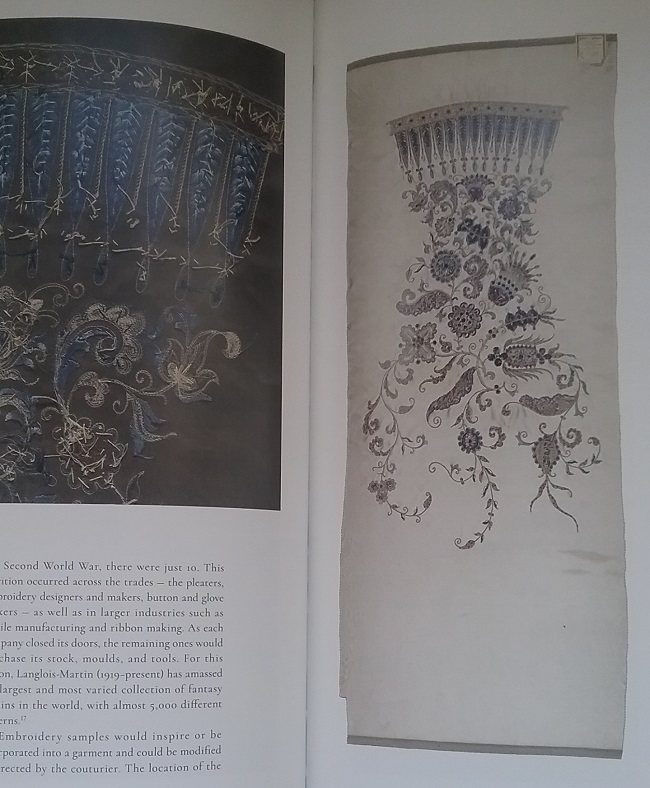 The left photo shows the reverse of the embroidery, which was made with the use of a tambour hook. These embroideries were actually worked on the reverse. On the right is a finished front panel for this gown. Clients often chose to have a design made in a different color than was originally envisioned by Dior. In this case, Caracas was designed as a black dress, but I think it works quite well in this icy blue. 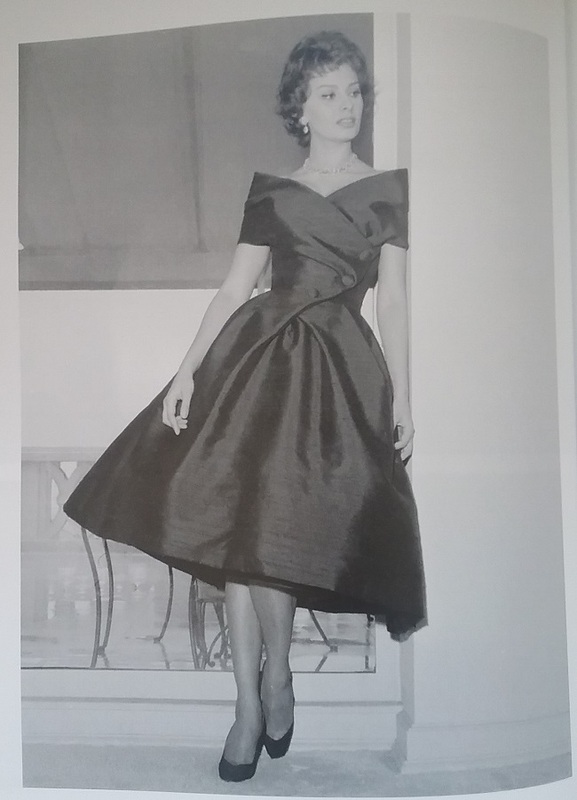 And here is the dress in black, worn by Sophia Loren. 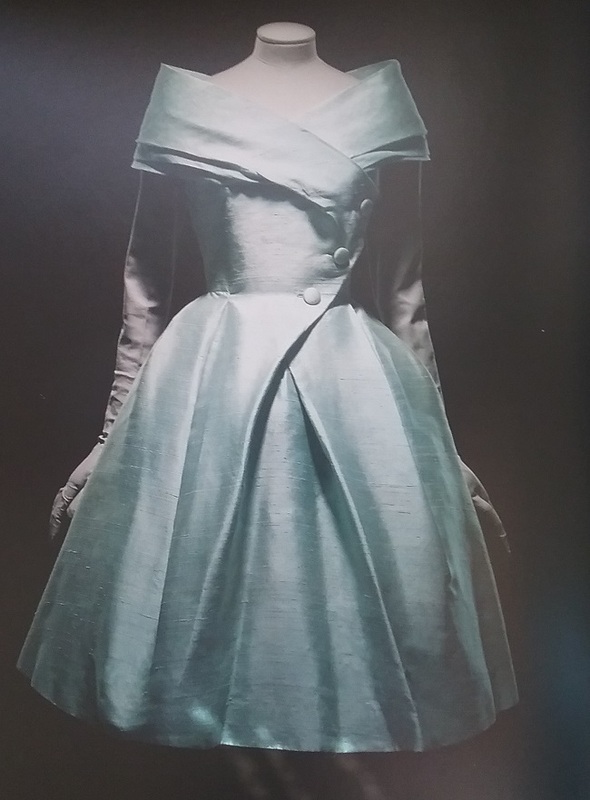 Both dresses were made in a special silk developed by the textile firm Staron, a frequent supplier to Dior. Staron would offer as many as 300 colors in a collection. You can see some of them in the top photo. 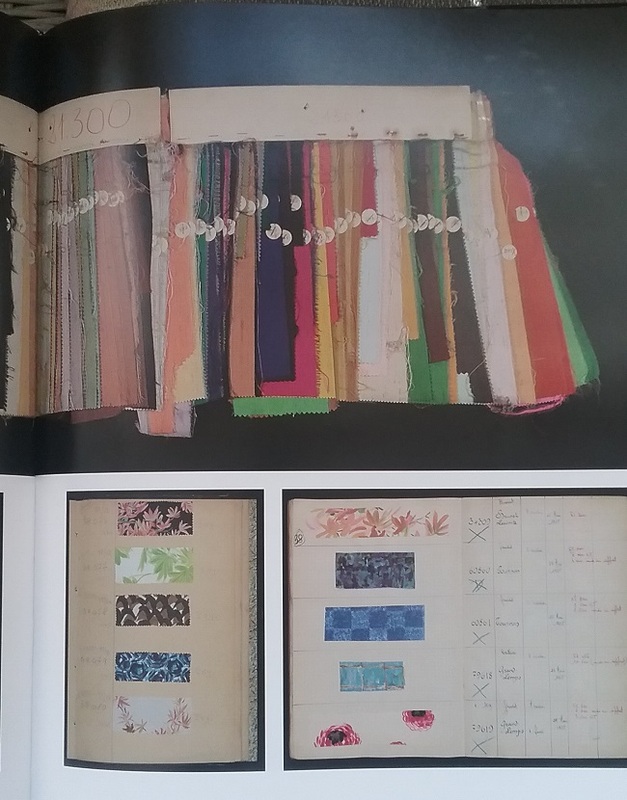 Probably my favorite part of this book was the six technical sketches of patterns developed by Berta Pavlov. Seeing a simple black dress with a pleated skirt all laid out that way makes it more than obvious that Dior did not do simple. This skirt was constructed by sewing thirty-three two-piece godets into slits cut into the one-piece skirt. That means this skirt has a total of ninety-nine seams. Unfortunately, this leads to what I disliked about this book. Many of the garments were black, and they were photographed on a black background. As you can see, the dress just melts into the black. At first I thought it was just my very poor eyesight playing evil tricks, but as this lightened photo shows, there simply is not enough contrast for one to be able to see the dress. I find this a bit puzzling, seeing as how we are treated to all kinds of details and close-ups throughout the book, but then can’t see the finished product in many cases. Still, it’s not enough to keep me from really loving this book. If you want a biography of Christian Dior, this is not the book. 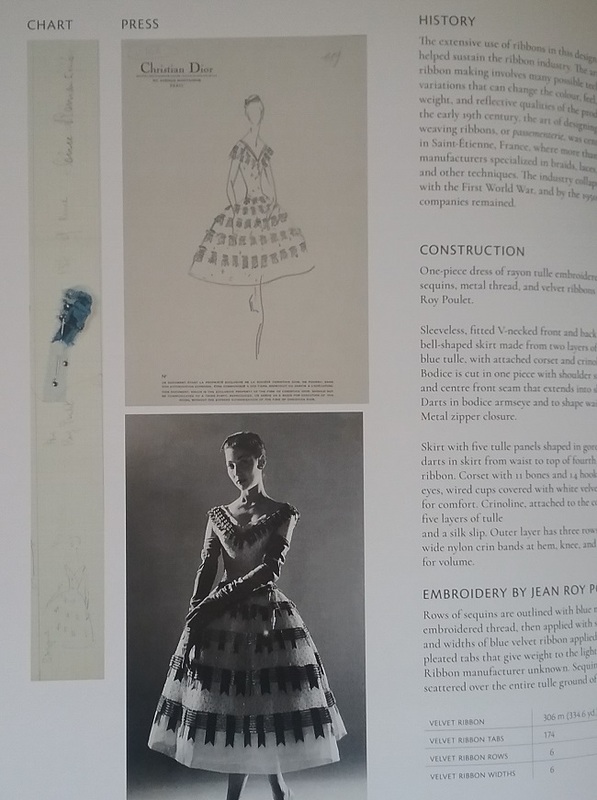 If you want to learn more about how haute couture as practiced by Dior led to some very remarkable clothes, then this is the book for you. It’s been a while since I shared a book I’ve been reading, but I’ve picked a real winner to recommend this time. 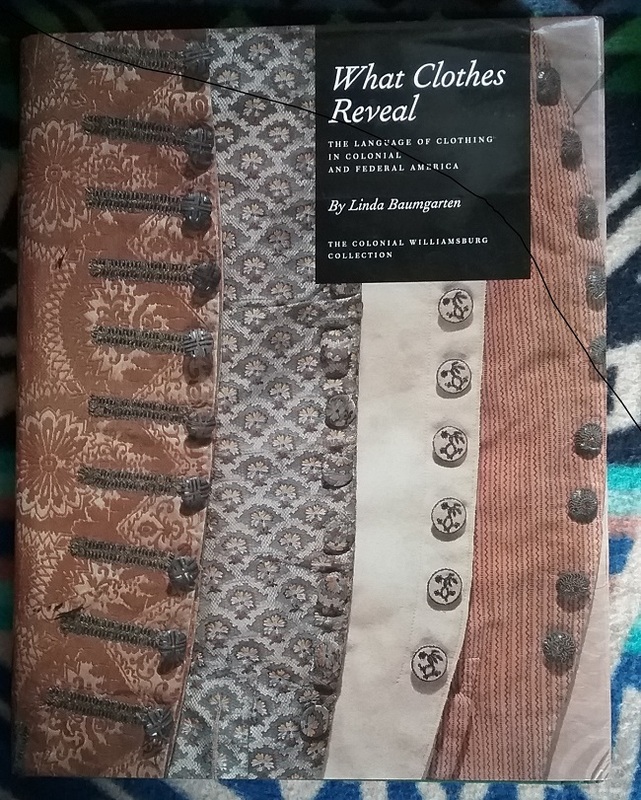 What Clothes Reveal by Linda Baumgarten is considered to be a classic in eighteenth century clothing studies. 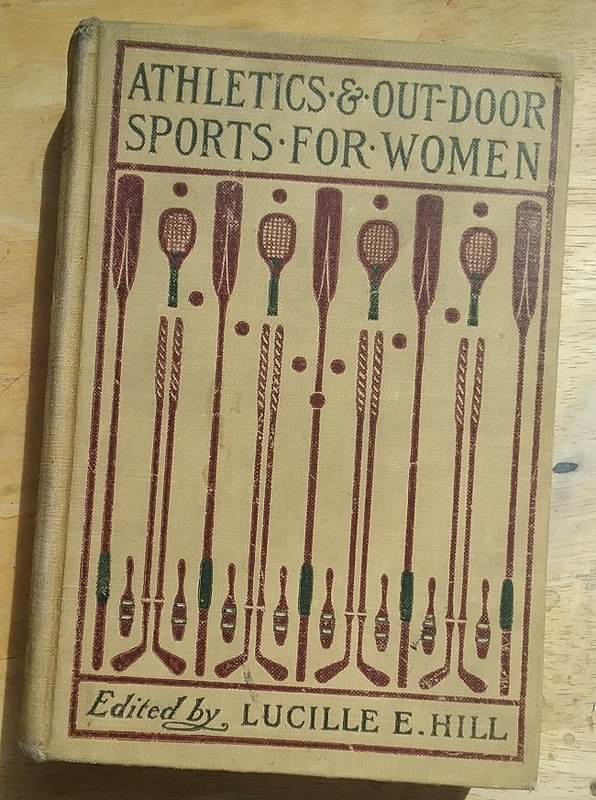 Yes, I know the eighteenth century is far beyond my usual subject of twentieth century sports fashion, but it never hurts to widen one’s knowledge base. 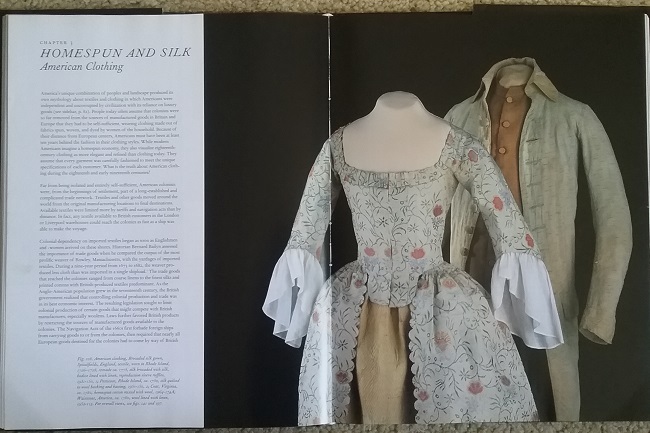 And while the book is based on Colonial Williamsburg’s Colonial and Federal era clothing collection, it’s really more an book on how to read the clues contained within historical clothing. As expected, there are lots of pretty pictures of exceptionally pretty garments. But this is not the story told in What Clothes Reveal. What we are given is a look at and inside of clothes from all walks of life; clothes for the rich and the poor, the young and the old, male and female, enslaved and free. 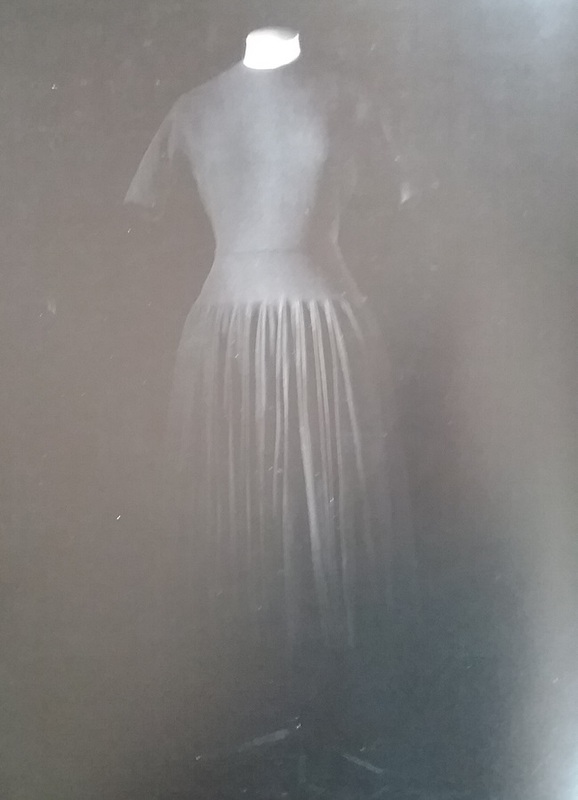 I found Baumgarten’s writing about clothing that has been altered to be of real interest. She pointed out that most of the garments in the Colonial Williamsburg collection have some kind of alteration. And that’s not necessarily a bad thing. Altered clothing confirms and illuminates the written record of how people lived with their clothes.Each garment has a different story contained within the threads and fibers themselves, allowing modern onlookers to peer into the lives of those who wore items over many years and who adapted to constantly changing life situations. 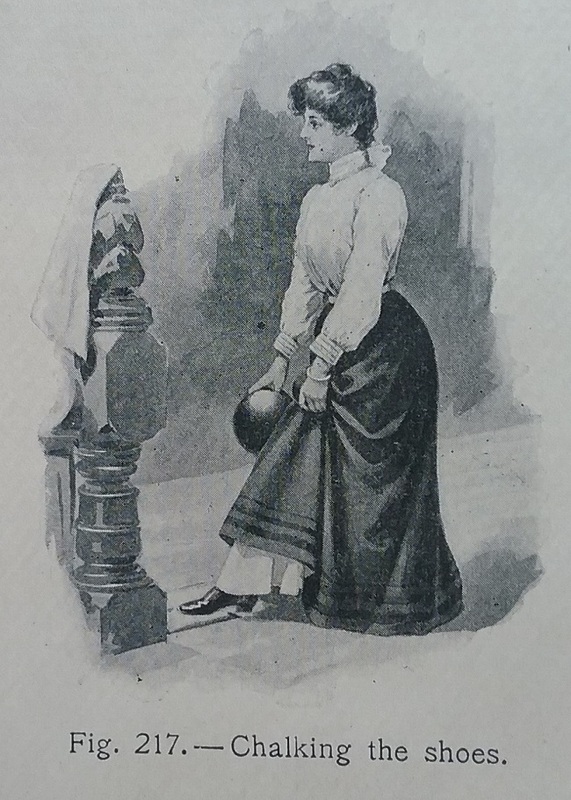 Altered clothing shows how people related to their own histories and reveals that continuum in the present, allowing people today to share in the history.If a pristine garment is a valuable snapshot of a person, places, or time, then an altered garment is a motion picture that tells another compelling story worthy of careful preservation. 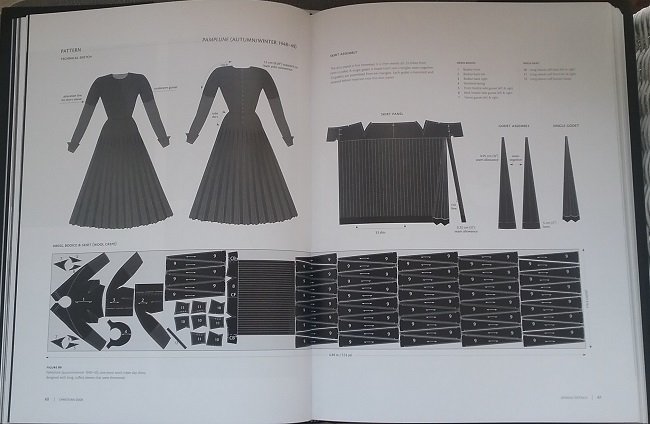 Baumgarten has illustrated her book not only with pictures of garments, but also with the historical references that show similar garments as they were worn. It’s a great example of how history is actually practiced by historians. Does she look familiar? This is Anne Shippen Willing, whose portrait was featured in another book I’ve reviewed here, Portrait of a Woman in Silk, by Zara Anishanlin. 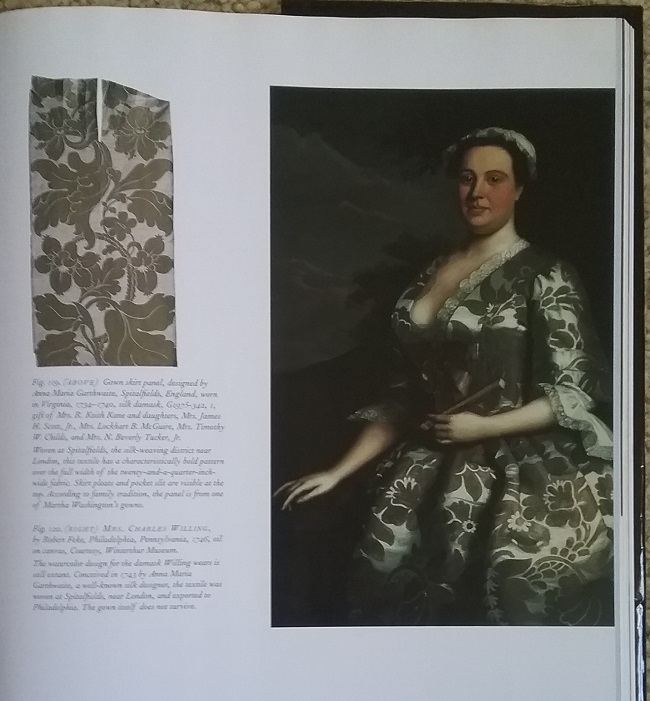 The textile was designed by Anna Maria Garthwaite, and Colonial Williamsburg has a very similar design on a silk panel from a skirt (supposedly owned by Martha Washington). Have you ever wondered how Lucy Locket managed to lose her pocket? 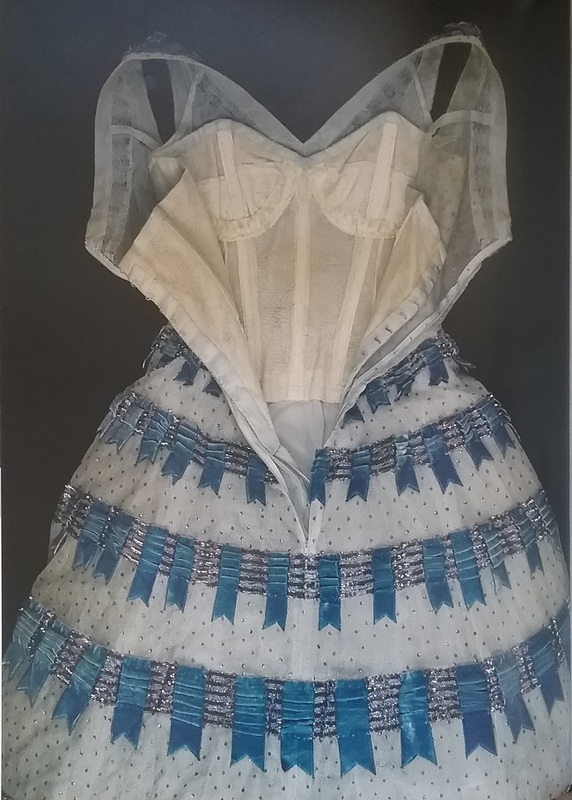 In the eighteenth century pockets were separate items and were tied around a woman’s waist under her petticoat. Lucy’s knot must have slipped. For many of the garments illustrated, we are treated to multiple views, including closeups of the textiles. 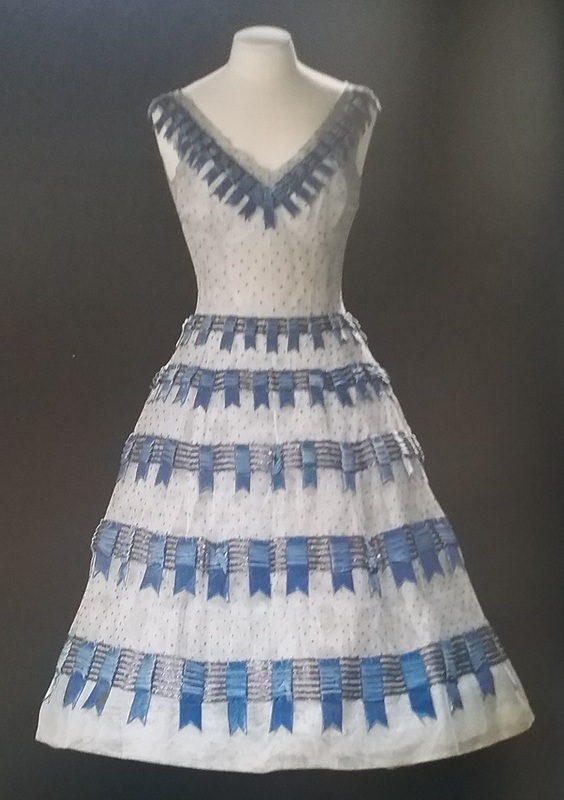 This circa 1810 gown was made from a block-printed cotton. 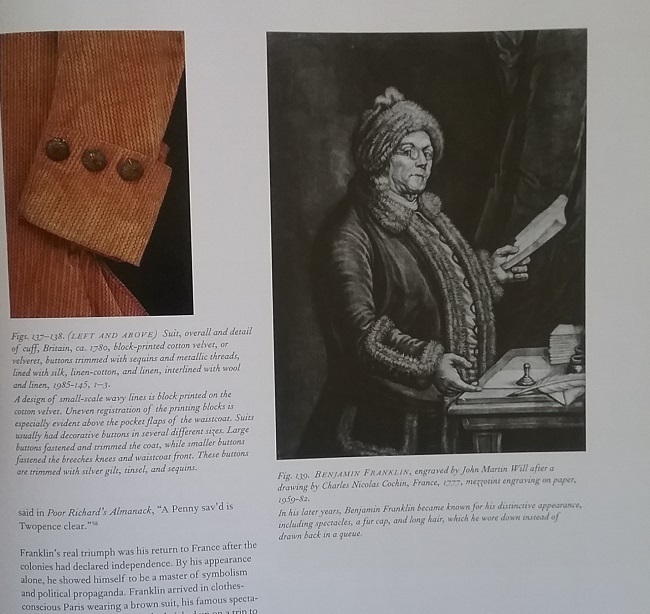 The book ends with a very useful timeline which shows the changes in fashion from 1690 through 1835. It’s a lot to absorb, but is a great reference. 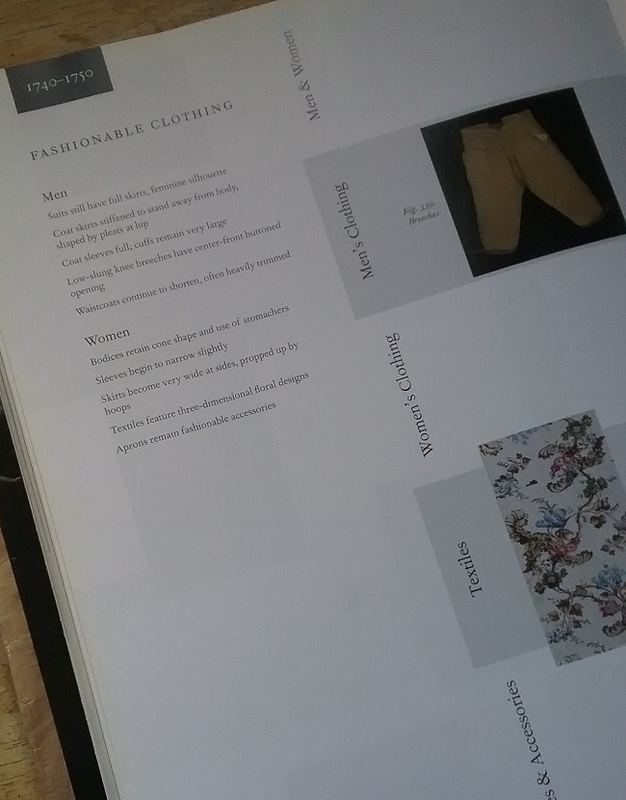 There’s a lot of information within the pages of What Clothes Reveal, and a lot of big ideas, but I found myself totally caught up in each and every page. 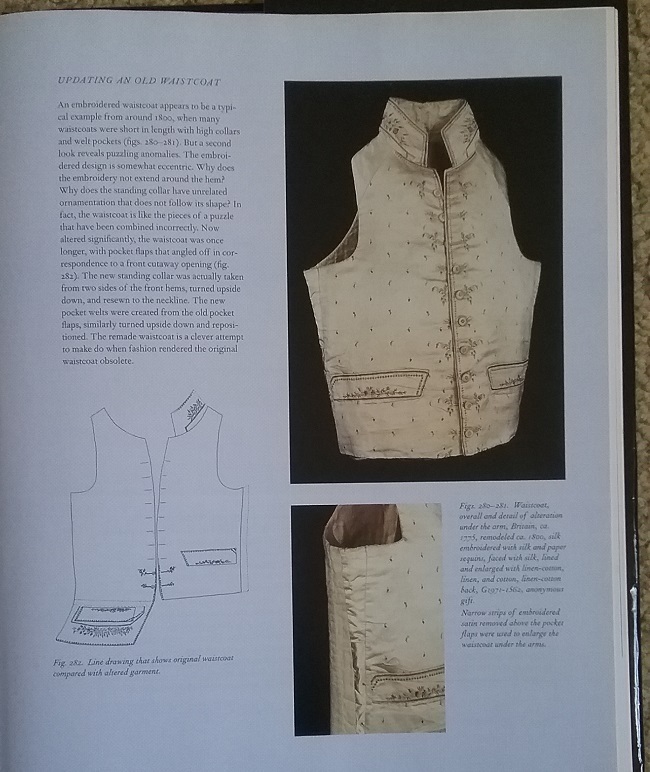 The book is so readable and free of jargon that the concepts were clear even to a person who is not that familiar with pre-twentieth century clothing. I think I appreciated this even more than usual because I had just finished reading Cubism and Fashion, by Richard Martin who had been the curator of the Costume Institute at the Metropolitan Museum of Art. The language was so ponderous that I found myself rereading paragraphs (dictionary in hand) just so I could understand what he was saying. I find that many of the Met’s exhibition catalogs suffer from the disease of pompous language. In an age where museums are striving to become more relevant, it would help if the average reader could understand the language being written. I’m fascinated with quilts. No, I don’t collect them, nor do I make them. It’s the historical meaning hidden within these little pieces of textiles that keep me interested in them. Recently I drove to the Pickens flea market in Pickens, SC. I’d been before, and knew that it’s a very mixed bag of good and bad, new and old, and down right bizarre. The highlight of the visit was a bluegrass band in which a little mutty dog was the fifth member. He had been taught to let out a howl at just the right time. I was too amazed to even take a video. I had been all over the field – and it’s a big one – with no luck when I stumbled upon a used book seller. He had a few books on quilting so I stopped to have a browse. 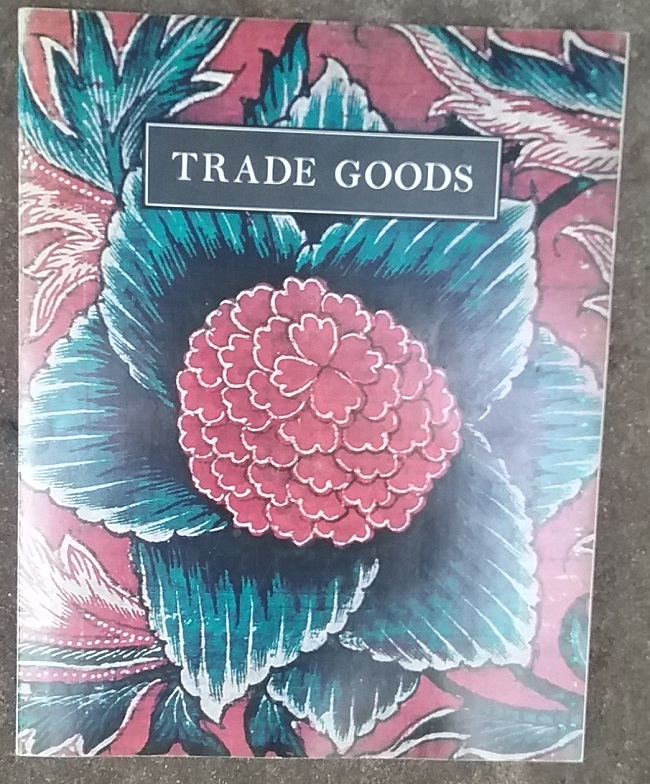 I asked the price, which was a dollar each, so I was feeling extravagant and had about five or six picked out when the seller said he had more in the back of the truck. What he had was the entire library of a long-time quilter. There were easily several hundred books on quilts, most of them how-to books. I wasn’t interested in those, but there were also quite a few books on quilt and textile history. I ended up with eighteen of them, which he let me have for $10. The prize of the lot is the book above, Barbara Brackman’s quilting classic, Clues in the Calico. I had been looking for this book for a long time, but I didn’t want to pay the high price it commands. 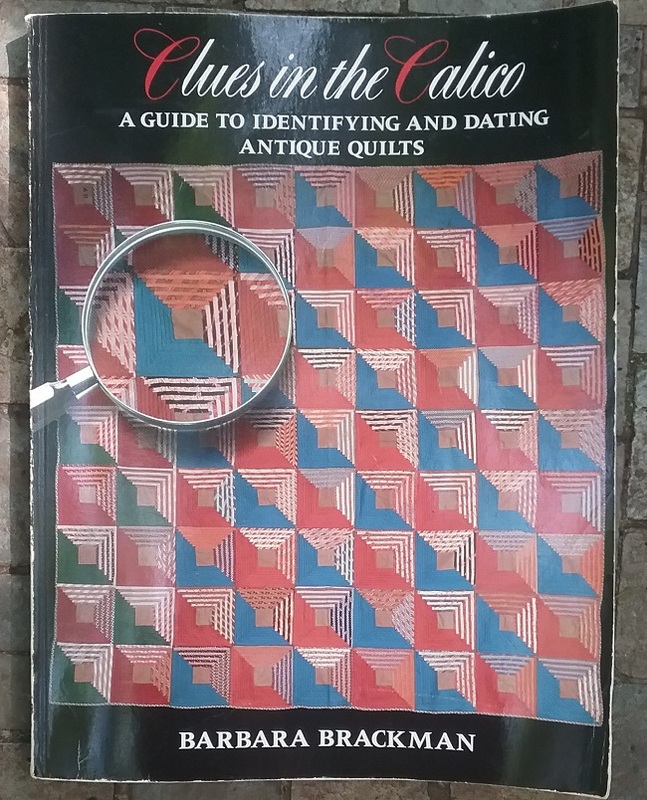 It is a guide to dating quilts, but more than that, it’s a guide to identifying antique textiles. I’m still reading this one, but I found myself using the information a few days ago when someone on Instagram posted a recently found hoard of old fabrics. Immediately I knew that some of the prints had been printed with “fugitive” green dyes, as the stems and leaves of plants were now a tannish brown. Some of the books are general quilt histories, but most focus on a particular type or region. 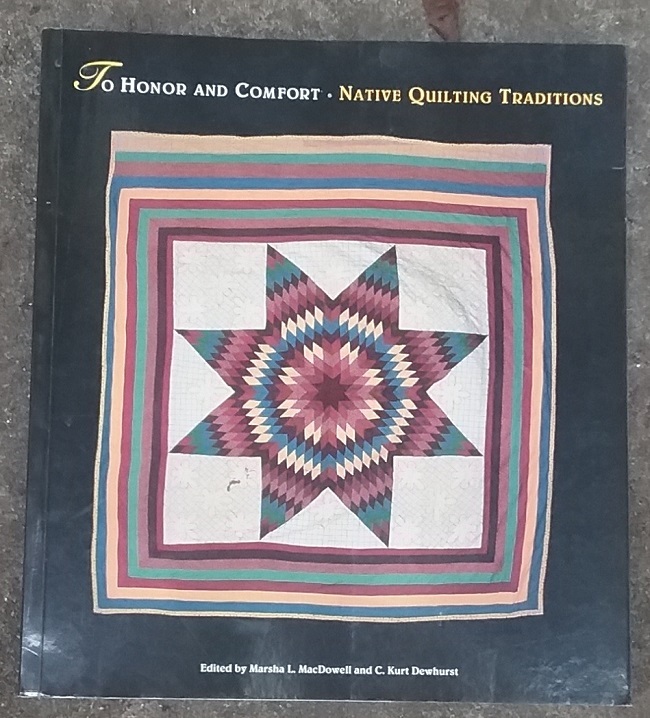 I thought this title was very interesting, as I do not associate quilting with Native Americans. I’ll probably put this one at the top of the reading queue. 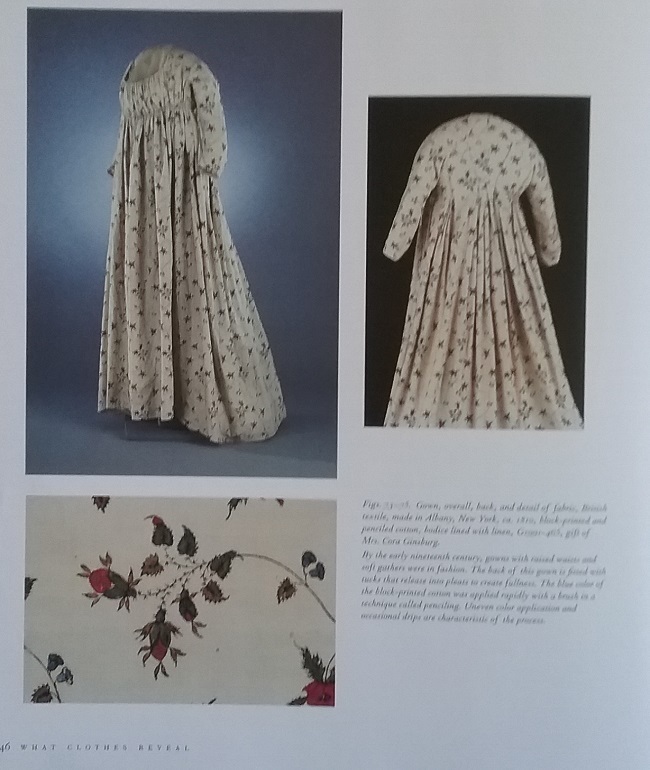 There were also a couple of books on textiles, and in particular the types of textiles commonly used for quilts. I’ve read probably four or five of the books, and I’m beginning to see quite a bit of the same information. That’s not a bad thing. I certainly don’t want to read conflicting “facts” as then, how would I figure out who to trust? 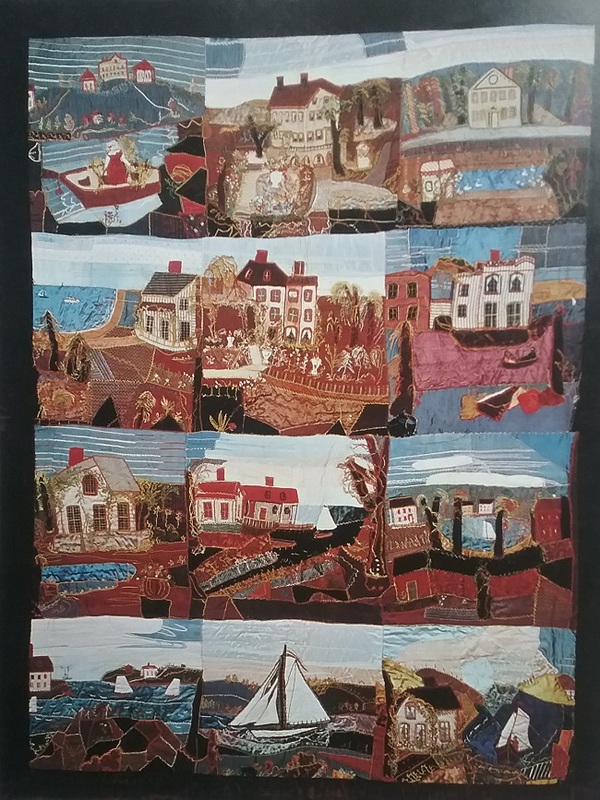 Several of the authors have pointed out one of the big fallacies of early quilt-making in America: that colonists made patchwork quilts out of their old textiles out of necessity. I already knew this, but it seems to be a generally held belief when so many writers take the time to make sure that the earliest quilts were not scrap projects in a make do and reuse sense. The earliest American quilts were generally whole cloth quilts, or were quilts made from appliques cut from fabrics that were printed specifically for that purpose. 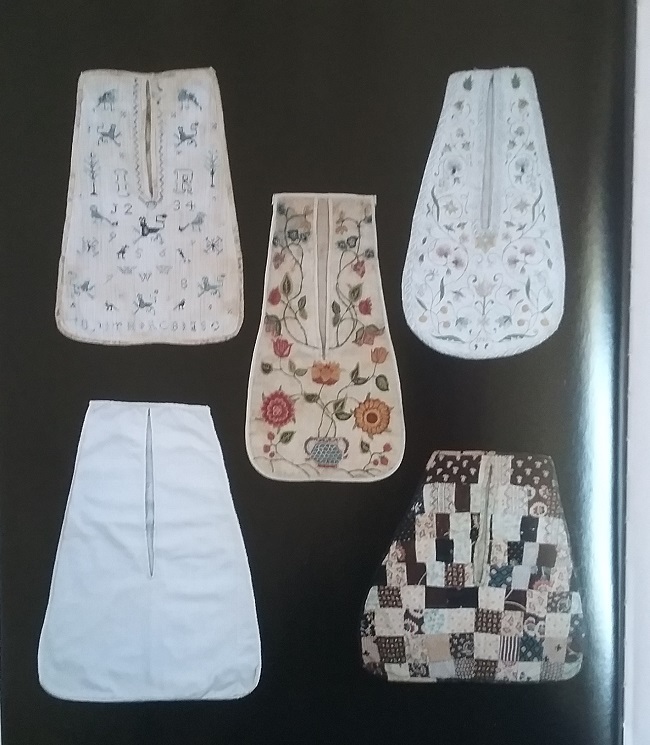 Two of the books are detailed accounts of the quilts of one family of makers. I’m in the process of reading one of these, Mary Black’s Family Quilts, by Laurel Horton. I’m enjoying this one partially because Mary Black lived in Spartanburg, SC, which is only an hour and a half down the road from me. And besides that, many quilt books tend to focus on quilts from Pennsylvania or New England, so it’s nice reading about quilts from a Southern family. I need to point out that it’s almost impossible to separate the production of quilts, textiles and clothing in the days before the Industrial Revolution. All the quilt books I’ve read so far also discuss cloth and clothing production. I’ve had to stop and remind myself that the authors of these books are quilt – not clothing – experts. In referring to the South Carolina backcountry in the late 18th century, Horton writes, “Fabrics were available in abundant variety in local stores for home sewing as was ready-made clothing.” While ready-made fabrics were readily available, ready-made clothing was not. Most of the ready-made clothing at this time was very cheaply made, and was marketed in the South as being appropriate for enslaved people. The best explanation I know of for this is found in Suiting Everyone: The Democratization of Clothing in America by Claudia Kidwell and Margaret Christman. Okay, no more quibbling over the details; let’s look at some quilts. 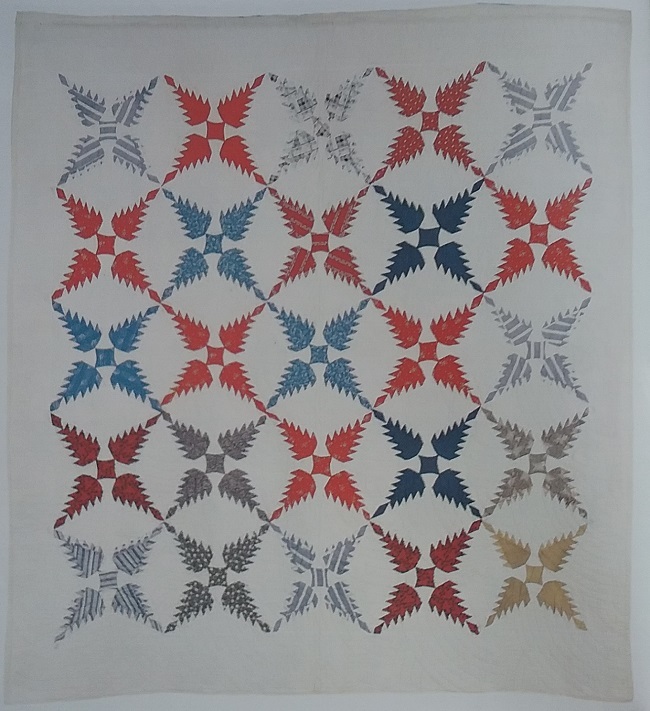 The one above is pictured in Kentucky Quilts 1800 – 1900 by John Finley and Jonathan Holstein. It was made by Ann Johnson Armstrong, circa 1890. 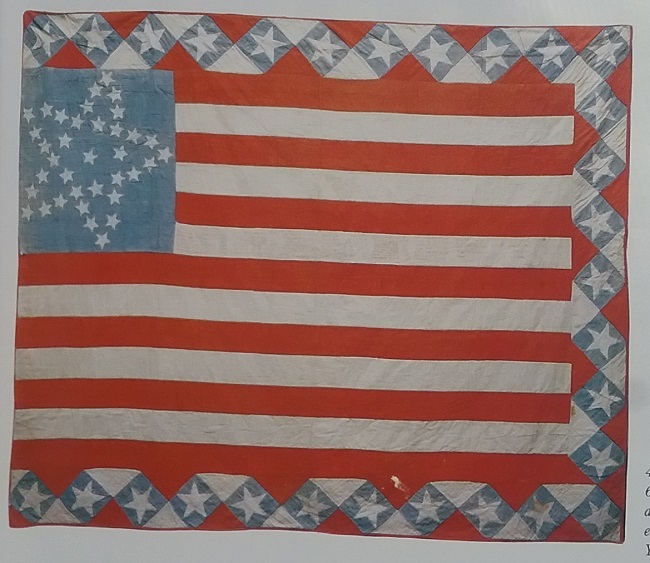 Emma Van Fleet made this quilt in 1866 to commemorate the Civil War battles in which her husband had fought. There are forty-seven battles. Seen in Threads of Time by Nancy J. Martin. The maker of this one, also seen in Threads of Time, is unknown. It was made around 1865. 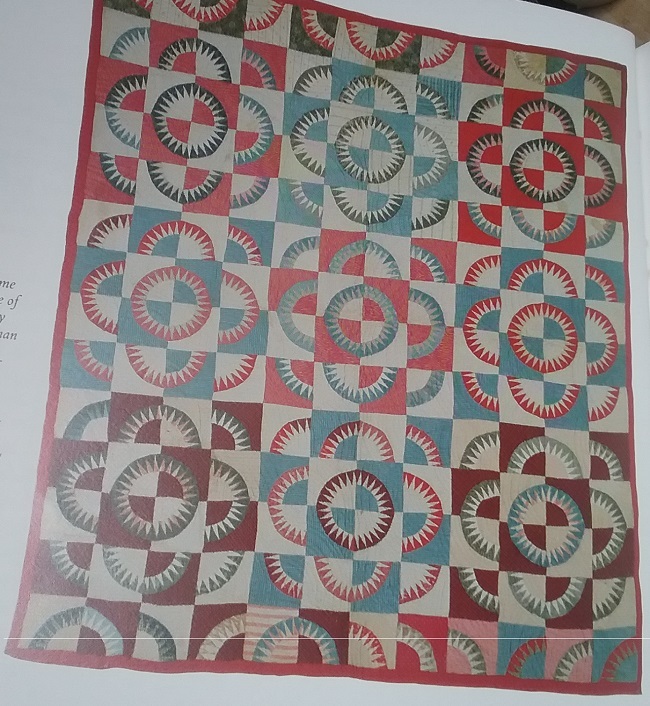 And finally, this marvelous creation is seen in New Discoveries in American Quilts by Robert Bishop. 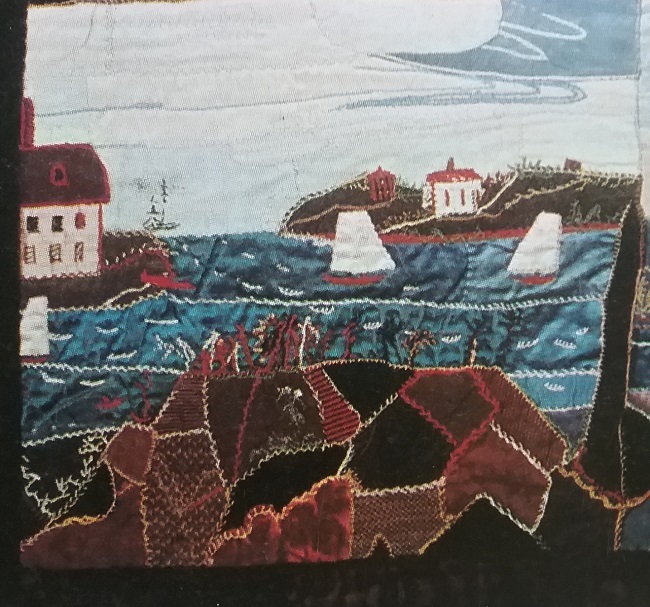 The quilt was made by Celestine Bacheller, and the blocks are thought to depict real places around her home in Massachusetts. It’s a sort of scenic/crazy quilt hybrid. It is now in the collection of the Museum of Fine Arts, Boston. 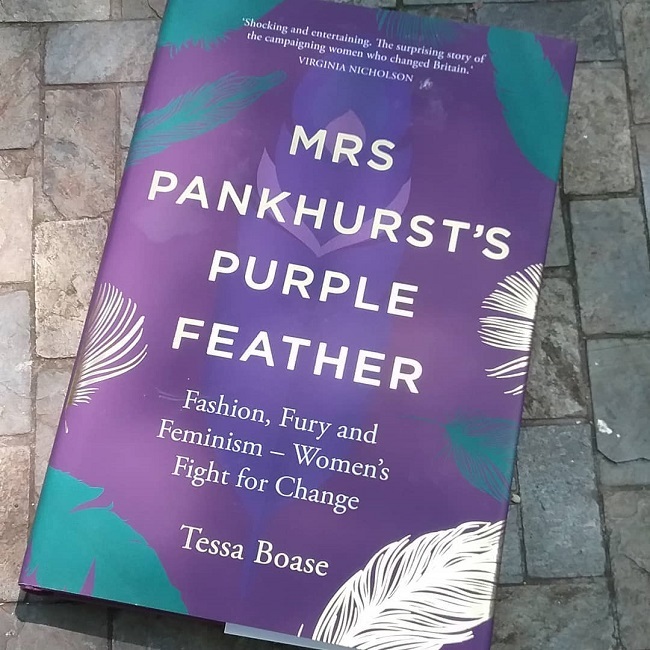 Mrs. Pankhurst’s Purple Feather is the story of two movements for change, and the two women behind the movements. One story, that of Mrs. Emmeline Pankhurst, is well documented. She was the force behind WSPU, Women’s Social and Political Union, one of the groups fighting for the right of women to vote in Great Britain. Lesser known was the other woman, Etta Lemon, the leader of the SPB, Society for the Protection of Birds. I had, in fact, never heard of Mrs. Lemon, but I was pleased to meet her acquaintance. In today’s world many of us are very concerned about the rights of animals, and so it is very fitting that Tessa Boase has brought Etta Lemon’s story into the limelight with this book. The book begins with Etta Lemon, and how she came to be a fighter for birds in a time, the late 19th century, when birds were prized as hat decorations. It’s hard for us to believe today just how many birds were killed so that their feathers, wings, and entire bodies could be perched on top of a woman’s head. For a quick and easy introduction to this issue in the USA, listen to Murderous Millinery at the Dressed podcast. Part of the feather story that is often neglected is the human cost. The feathers as they came from the bird were not beautiful enough to satisfy the fashionable, so many women and children toiled at rock-bottom wages to process and enhance feathers. In a very enlightening subplot, Boase tells us the story of Alice Battershall, a feather worker who stole a feather from her work, and who paid the legal price of three weeks hard labor in prison. Mrs, Pankhurst, the champion of women’s voting rights, cared not a whit for the plight of birds. As a fashionable woman, she loved her hats which were frequently trimmed with feathers. World War One, which started in 1914, pretty much put both movements on the political back burner. After the war ended, the world had changed tremendously. Women, whose wartime work had been invaluable were given the right to vote (not all at first, but eventually all were enfranchised). 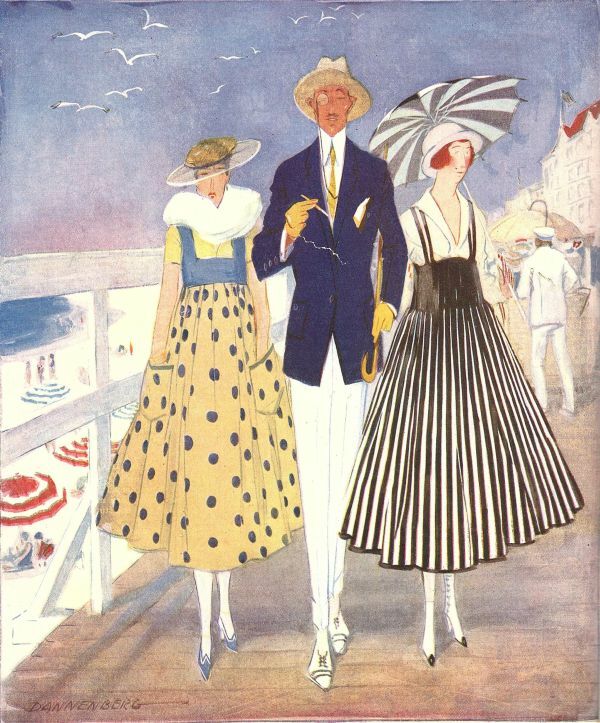 And the elaborate styles of the prewar years faded as a more modern and streamlined woman of fashion emerged. Mrs. Lemon finally got her bird law in 1921, just as demand for feathers in fashion dropped. You know, this was exactly the book I needed to reassure me that there have been lasting changes made for advancement of women and the protection of our natural world. With so much of the news out of Washington causing concern on these issues, it’s nice knowing that justice does often win in the end. This book was sent to me as a review copy, but those of you who know me know that the opinions expressed are entirely my own. Yes, I do recommend this book, and I want to thank Tessa Boase for arranging for me to read this fascinating story. One of the great joys of the Goodwill Outlet bins is the over-abundance of books. I never leave the place without a stack of them, most of which I read and then pass on or re-donate. A while back I found an interesting volume, Caricature: The Wit & Humor of a Nation in Picture, Song & Story. 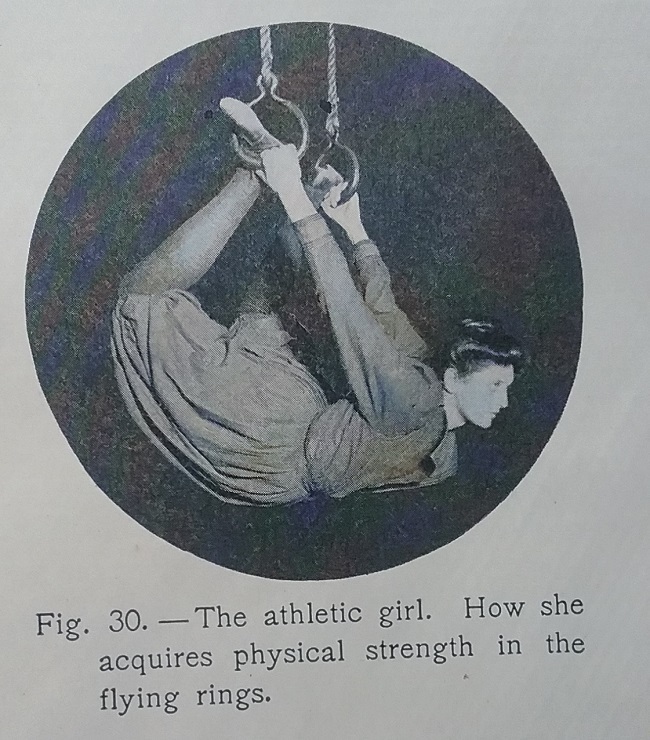 Of course it went into my cart, because as the subtitle promised, it was full of wonderful illustrations. 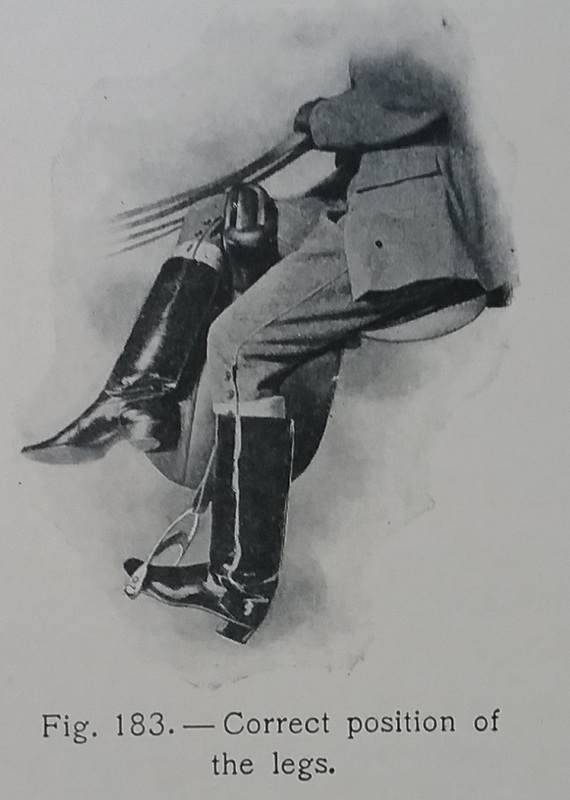 There’s no date on this book, but the Leslie-Judge Company published an annual Caricature starting around 1895. 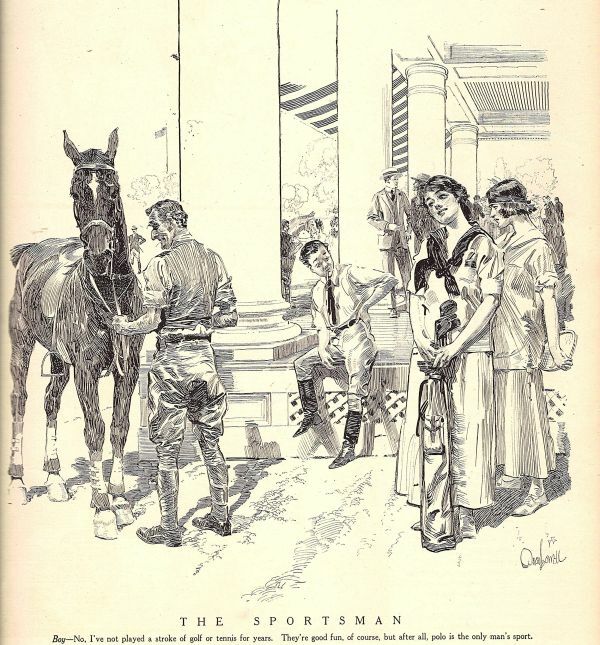 Several of the illustrations in this particular book are dated 1915, and so my guess it is from that year, or perhaps a year later. 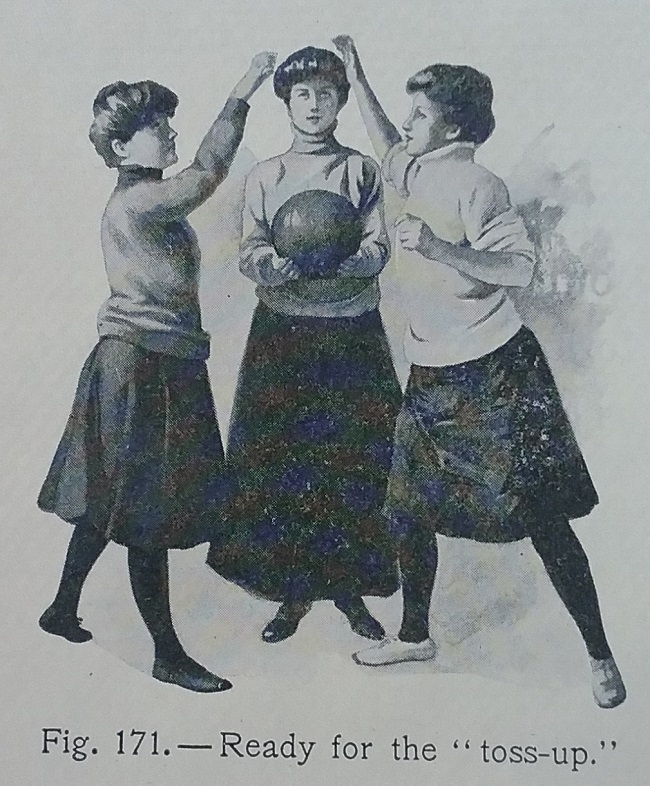 The sporting life was a popular theme. 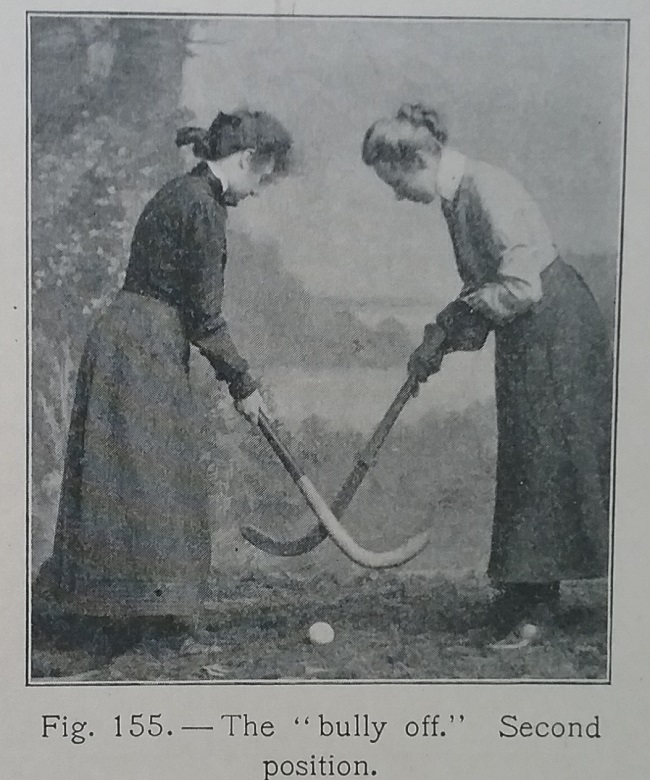 Maybe it’s because members of the leisured classes were a bit of an easy target for humorists of the day. I’ll admit that the humor is often dated, and would leave many modern readers scratching their heads. But I’m in it for the pictures, not the jokes. 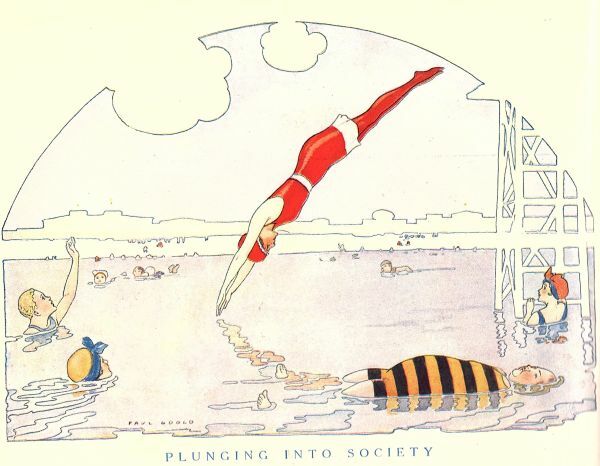 There are lots of illustrations of people swimming, and the bathing suits are incredibly modern for 1915. From what I’ve seen in the many circa 1915 photos I’ve examined, most women at the beach were still in long, woven wool or cotton bathing suits, not the sleek knit ones seen above. This one is especially skimpy. Do you suppose the man is her father and is getting ready to lock her in the bath house? 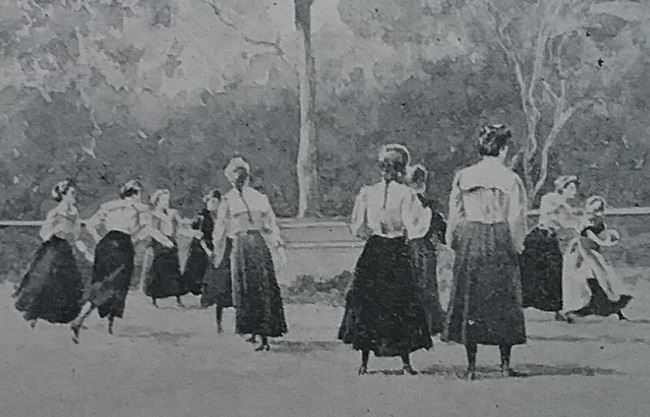 Here the young women are still wearing their schoolgirl middy blouses. 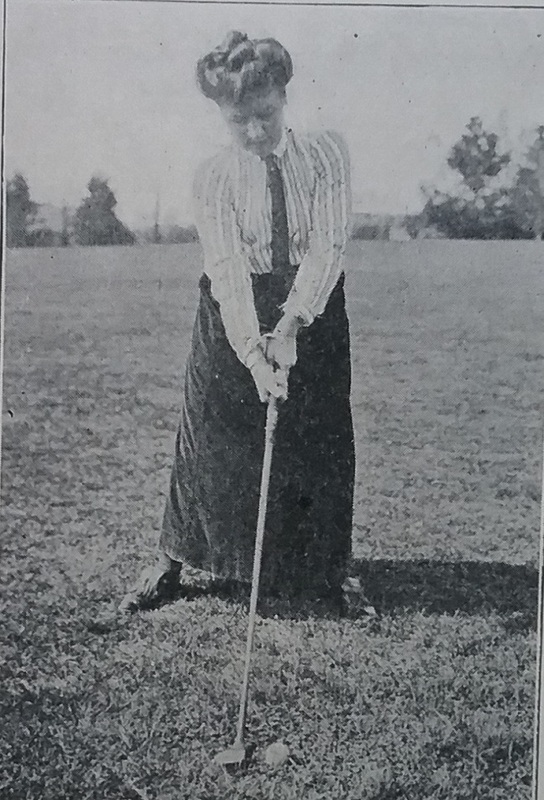 This was a common look for tennis and golf. Notice that girl with the tennis racket is wearing a headband to control her hair. As I wrote earlier, this is a look associated with the 1920s, so it seemed a bit early for this style to appear in print. 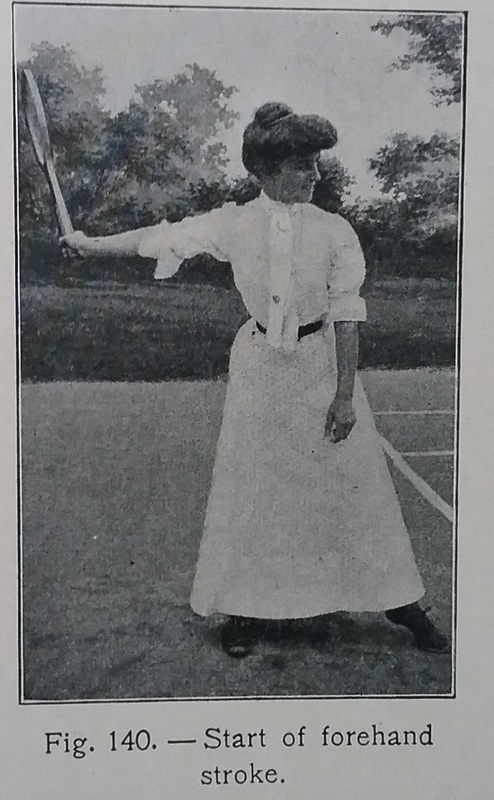 I knew that the look was popularized by tennis star Suzanne Lenglen, and a quick google search found a 1914 article showing Lenglen wearing the famous bandeau. 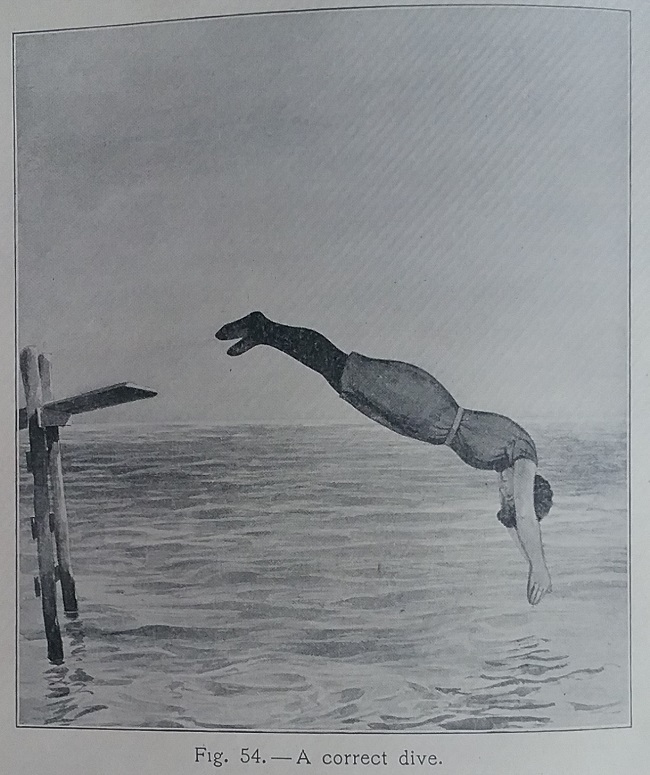 Just as interesting as the sporting pictures are those showing well-off people at leisure. and three more (bulldog included) who would rather be, well anywhere but on that boring boardwalk. 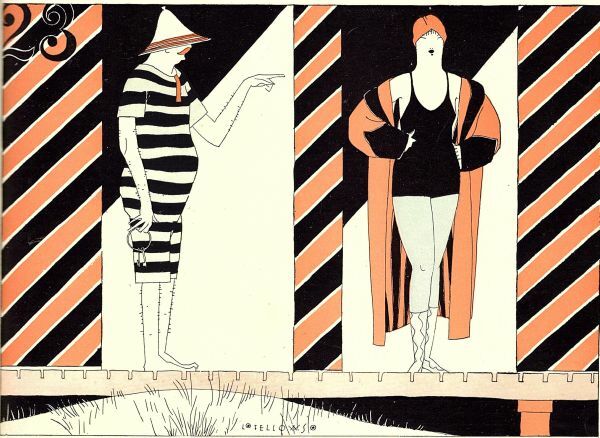 But these illustrations show how the fashion silhouette of 1915 was showing big changes over the previous years. The skirts are shorter with considerable fullness. 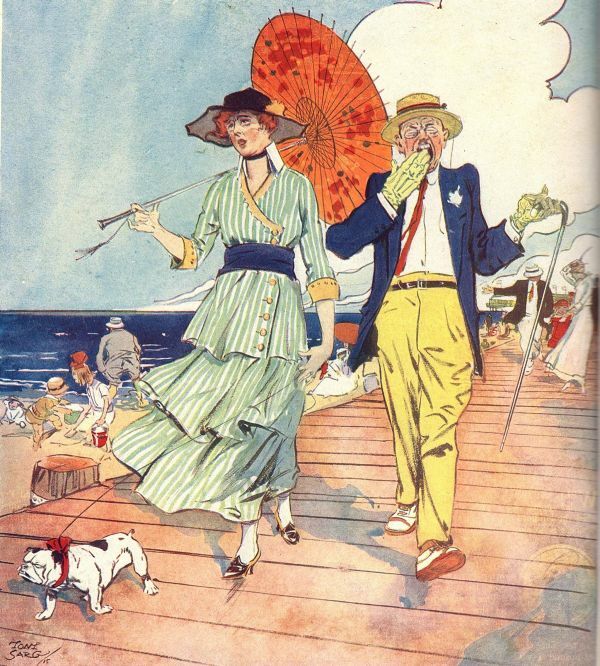 And it seems obvious to me that stripes were very popular for seaside wear. You do have to look at period illustrations with a questioning eye. Drawings are often exaggerated to make a point, as we see in the skimpy bathing suit drawing above. But look carefully, and you just might learn something, as I did with the tennis headband. One of the things I love about fashion history studies right now is that historians seem to have moved beyond writing about Chanel and Dior. I said some time ago that I didn’t know what else could be said about the great and familiar names of fashion. It appears that lots of others are in agreement. 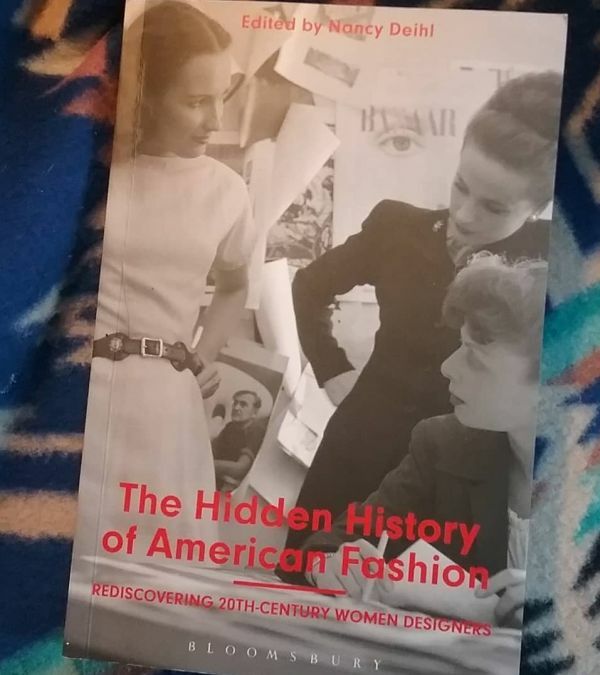 The Hidden History of American Fashion: Rediscovering 20th Century Women Designers is a book after my own heart. Edited by Nancy Deihl, the lives and careers of sixteen designers are explored. Some, like Tina Leser, are familiar to me, but others, like Pauline Fracchia and Catherine Scott were not. All are important to the story of American fashion. Each chapter features a different designer, and each is written by a different historian or team of two. I like this type of book because it is easy to pick up and read one chapter when time (or attention) is short. Each chapter is well-documented with the sources given. One of my favorite chapters is about designer Libby Payne. Payne was one of the hundreds of designers who worked without ever having their names on the label. Though her career spanned from 1937 to 1987, it wasn’t until the early 1980s that her name was on the label of a line she worked on. She designed for some very big names, among them Bobbie Brooks, Jonathan Logan, and Saks fifth Avenue. It’s great that now her name is a part of the historical records of the companies she helped make successful. 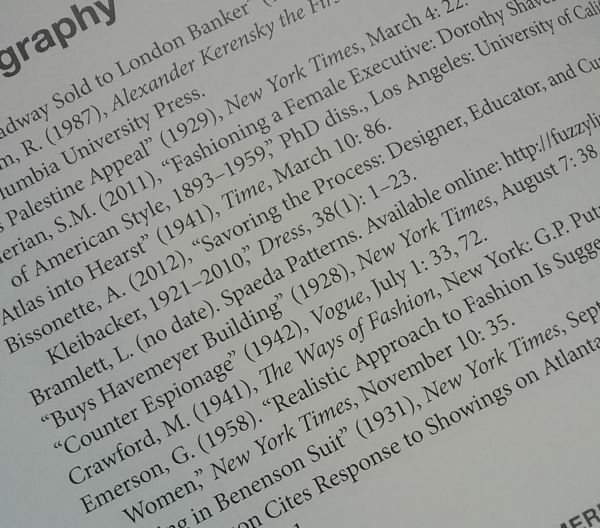 I was really surprised and pleased to spot my own name in the bibliography of one of the chapters, that on Fira Benenson. I was familiar with Benenson because I had seen the sewing patterns adapted by the Spadea company. Author Michael Mamp referred to the patterns, and referenced and quoted the article I wrote concerning how Spadea cut their patterns directly from the designers’ garments. This was information I got from Anne Spadea Combs, the daughter of the owners of Spadea Patterns. I can’t help but think of how the internet has allowed this book to be written. So many of the sources are primary ones that are easily accessible due to back issues of newspapers and trade materials being available online. Material that used to be buried deep in microfilm is now easily found. It is gratifying to know that even blogs like this one are now contributing to the written record and are useful to others doing research.